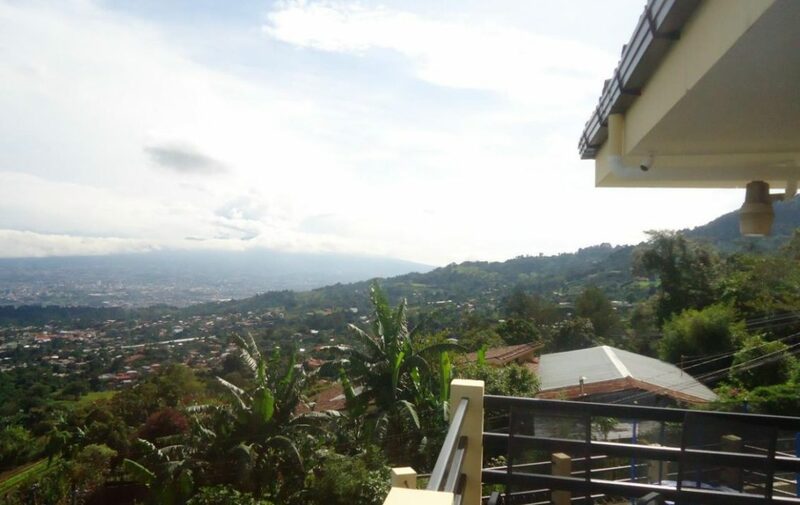 Home | Real Estate | Homes For Sale in Costa Rica | Escazu Mountain Home For Sale With Magnificent City Views. US$189,900. Outstanding Escazu mountain home for sale with magnificent city and valley views. Located in San Antonio de Escazu, this beautiful mountain home is only minutes away from shopping and schools. The main house is situated on the 2nd floor to gain on the views. There is a wide exterior stairwell that goes up from the garage to the front door and the main house. The owner is very motivated to sell and for that reason, the property was listed much under market value. Most homes of this property size in the Escazu area, are priced well over $250,000. The seller will listen to reasonable offers. Contact the agent now. When this great mountain home was designed, the topography of the property was used to give this home the best view imaginable. From this house, you can see the cities of Escazu, Heredia, Tibas, Guadalupe, Moravia, San Jose and Curridabat. You’ll have incredible views of the Barva and Irazu volcanoes. This Escazu mountain home for sale offers 3 bedrooms and 2 bathrooms. The master bedroom has a walk-in closet and it’s own bathroom. The other 2 bedrooms share a bathroom. Downstairs is a maid’s room and bath. The laundry area is behind the kitchen. There is a large patio outside to dry your clothing if you don’t want to use the dryer. The garage will with 2 large cars. 6 More cars will fit on the property. San Antonio de Escazu is a quite area of Escazu. But it is only a few minutes drive away from schools, shopping and anything else you need. The bus stop is less than a block away. Most of the areas south of this Escazu mountain home for sale is protected area. The temperatures are much cooler than they are in San Rafael or in San José due to the higher altitudes. The home is located at about 1,300 meter (3,900 feet), the reason for the awesome valley views. I am interested in the availability of this home. Do you have a international number to discuss your listings? I’ll look thru the other listings. I am looking and ready to buy this year, but can not move there until Summer/Fall 2018. I came to Costa Rica last Sept and visited homes/properties in the Lake Arenal area and Orosi/Turralba. I loved the terrain of San Ramon to La Fortuna. I’ve decided on the Heredia hills and Alajuela province areas. I like this house because it is in the hills with flower/vegetable gardens & fruit trees. I look forward to discussing your properties. I am in Texas Central Time. It is easiest to reach me after 6pm weekdays and all weekend. I work in a restricted cell area and often do not get messages until leaving work. Hello Kim, thank you for your message, We just sent your questions to our recommended realtor Andrés Henfling, He will be in contact with you shortly. Please ask Andres to call me at 84904820 as I live in Escazu and would really like to see this home. Hello. Im interested in this home. I have some questions. I dont see a contact number so if someone could get back to me i would appreciate it.